For any of you who have grown your own veggies, you know that there’s no comparison to store-bought. Yesterday I came home to ripe tomatoes on the vine and red onions…they taste nothing like ones from grocery stores. They smell better, taste better and it’s nice to know you’re eating something that came from your own work. Since I’ve been up at the cottage a lot this summer, my fridge at home was a little short on ingredients. I basically had a big tub of feta cheese, eggs and condiments (half of them probably expired). So I figured I’d make do with what I had, and it worked out really well. 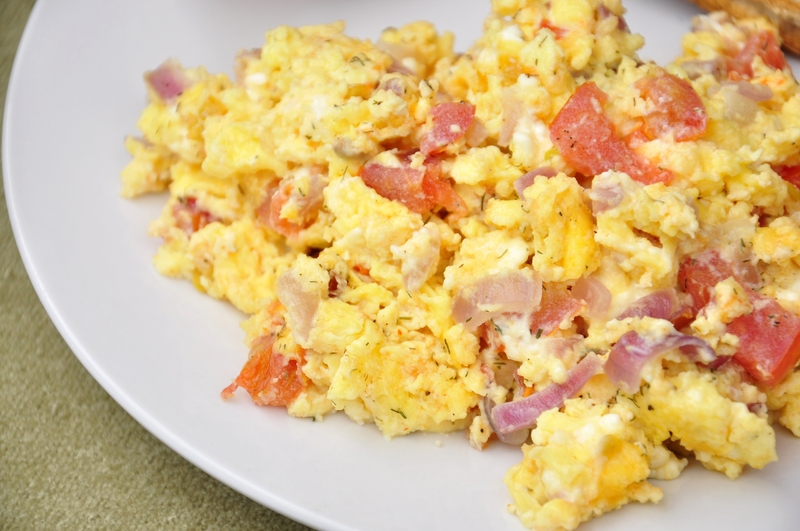 These eggs are also full of nutrients like vitamin A, calcium and protein. I think next time I’d add in some spinach as well just for some greens and extra veggies, but I’m still pleased with the eggs as-is. Heat vegetable oil on a large frying pan on medium-high heat. Add red onion and let cook for 3-4 minutes until softened and lightly browned. Add garlic and stir. Once onions have softened, add feta. 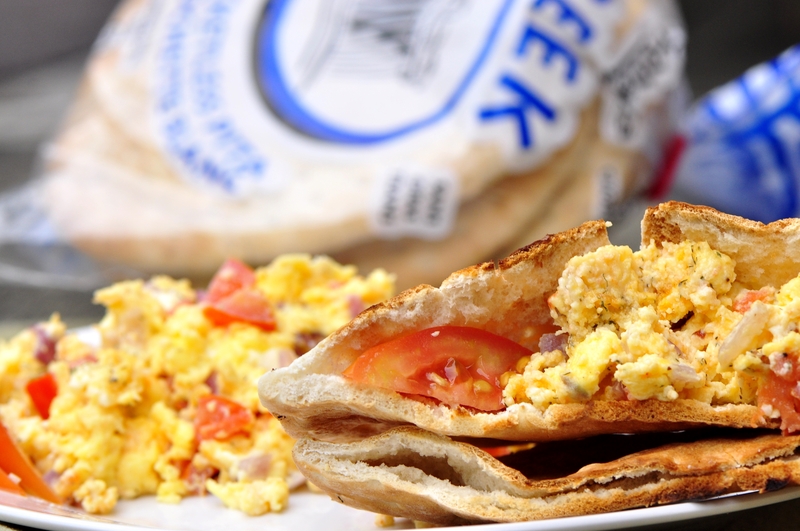 Once feta begins to melt, pour the beaten eggs into the pan. Stir very well so all ingredients are evenly mixed in with the eggs. Add in tomatoes, dill, hot sauce and black pepper; let cook for 5-6 minutes, stirring occasionally, until eggs are cooked through. 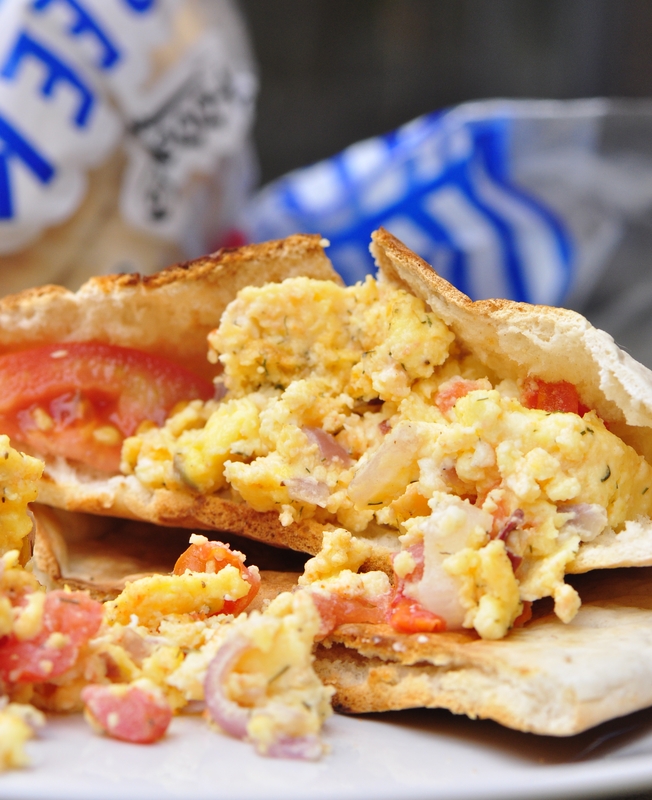 Serve with a Greek pita and extra tomato for freshness. I thought you should know I just drooled.